Stuffed mushrooms are one of my favorite things. Ok, actually mushrooms in any form are some of my favorite things. So, really, I’m kind of surprised at myself for taking so long to come up with this pasta version of my favorite italian restaurant appetizer! Sometimes I feel like I could be happy eating pasta every day for the rest of my life. I don’t think I would ever get tired of it. And I never get bored with coming up with new ways to satisfy my pasta cravings. I took this a little farther to make it low-carb (using low-carb noodles!) but feel free to use whatever noodles you like. And whatever you do, don’t skimp on the mushrooms. They are the star in this delicious dish! Preheat the oven to 450ºF. Place 2 tablespoons butter into a 9x13" baking dish and place in the hot oven until the pan is hot and the butter is melted, about 5 minutes. Remove the pan from the oven and toss the mushrooms and garlic into the pan with the melted butter. Place back into the still hot oven and roast for about 10-15 minutes, until the mushrooms are golden and very fragrant. Set aside. (And leave the oven on). While the water is boiling for the pasta, in a large saucepan brown the sausage until no longer pink, breaking it up into smallish bits with a wooden spoon as it cooks. Drain off any excessive grease and then add the cream cheese and cook over low heat, stirring occasionally until the cream cheese is melted. When the pasta is cooked, reserve about 1/2 cup of the pasta water and then drain the pasta. 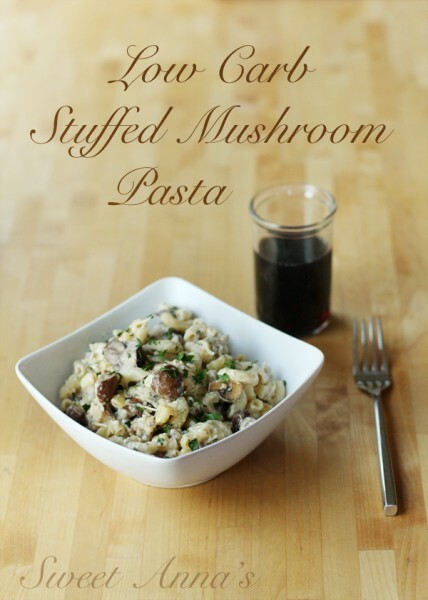 Dump the noodles into the pan with the mushrooms/sausage/cream cheese and toss to coat. Add in some pasta water, a little bit at at time, until the sauce coats the noodles. Stir in 3/4 cup of the parmesan, the parsley and seasonings, to taste. Dump all of this back into the 9x13" baking dish that you browned the mushrooms in and sprinkle with the remaining parmesan cheese. Place back into the still hot oven for about 5-10 minutes to brown the topping, and then serve! *Disclaimer: I do not eat THM style all the time. But I try to keep to the basic principles as much as possible and I truly enjoy coming up with new plan-friendly dishes. It’s so fun to eat food that you know is actually good for you!